Camp Nauvoo is fortunate to be located in the middle of beautiful gold country. We are blessed to have access to many outdoor activities such as whitewater rafting, hiding, swimming, picnicking, gold panning and fishing. We have many historical sites such as Coloma State and Gold Bug Park. 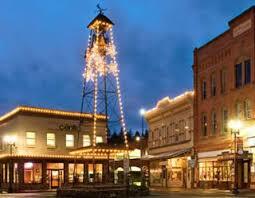 We are nestled in the foothills with access to Placerville Downtown and many delightful restaurants. Cascading down from the Sierra Nevada runs the West Coast’s most popular whitewater resource – the South Fork of the American River. 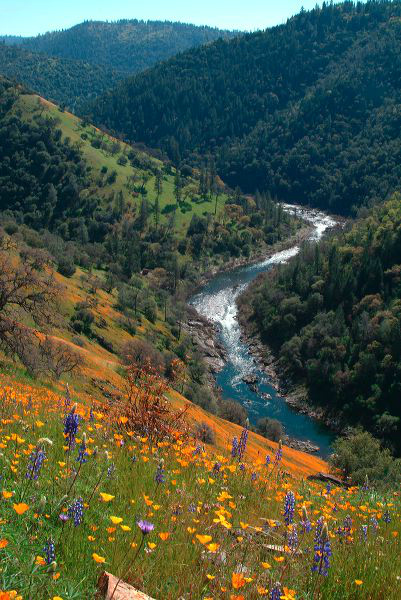 An intermediate (Class III) river, the South Fork American River is suitable for kids 7 to 75! South Fork consists of a upper and lower section both offering great rapids and beautiful scenery. The upper section of the American River quickly becomes a rollicking ride over countless rapids such as Meat-grinder, Racehorse, Triple Threat, and the infamous Troublemaker. This journey starts off with mellow Class I and II warm-up rapids. Then the canyon narrows with a series of near continuous Class III rapids – Fowler’s Rock, Satan’s Cesspool, Haystack Canyon, Bouncing Rock and Hospital Bar Rapids. Your journey ends on the warm, still waters of Folsom Lake. Numerous professional outfitters offer trips ranging from short half-day jaunts on up two-day adventures. Enjoy, breath-taking views, and abundant wildlife on trips tailored to individuals, families, corporate groups, Boy and Girl Scouts, church groups, team-building organizations – just about every conceivable type of trip possible. Some companies even offer dinners on their over-night trips with micro-brewed beers and local wines featured. 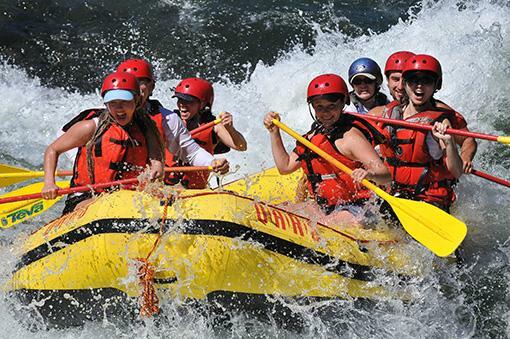 If you’re looking for a safe adventure, something different but within your comfort zone, consider rafting the American. You will return home refreshed with memories that will last forever. Gold Discovery Museum and Visitor Center: Here you can either obtain park maps and information, or see some amazing artifacts that were in Coloma during the Gold Rush. Address: 310 Back St, Coloma, CA 95613 Phone: (530) 622-3470 Hours: Monday: closed. Tuesday through Sunday: 10:00 a.m. to 3:00 p.m. 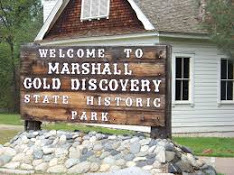 Guided Tours: Come rain or shine, Marshall Gold Discovery State Park offers interesting guided tours for $3.00 per adult and $2.00 per child. 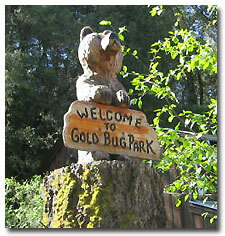 One of our favorite sites is Gold Bug Park located in the city limits of Placerville. You’ll step back in time when you enter the Gold Bug Mine! It’s a REAL gold mine from the Gold Rush days. Explore the Gold Bug and the mining museum. Find your riches in the gem panning trough. Be sure to visit our historic Stamp Mill and working Blacksmith Shop. For more information visit their website. For wine lovers, the county has more than 2,000 acres of vines, is home to over 70 unique wineries and produces some of California’s most sophisticated wines. This may just be California’s best-kept wine secret yet! For more information and a map of the wineries click here. 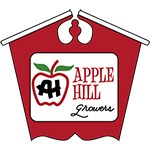 The Apple Hill® ranches are most popular during the fall and offer old-fashioned fun. Plan a picnic on the lush land that surrounds these exciting ranches. Their doors are open and the growers have gone the extra mile to ensure your family a day that they will remember. 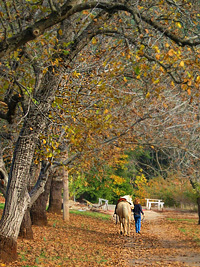 Today it boasts more than 50 ranches including Christmas tree growers, wineries, a micro brewery, Spa and vineyards. Open year round. Lessons are also taught in Shingle Springs. We have a covered arena. Desolation Wilderness is 12-1/2 miles long and 8 miles wide, and is accessed by 15 trailheads. The relatively small 63,960 acre Desolation Wilderness contains many small streams with about 150 alpine and sub-alpine lakes. Elevations within the wilderness range from about 7,000 to over 10,000 feet. Because of it’s close proximity to Lake Tahoe the Desolation Wilderness receives heavy use from June through September. Wrights, Echo, Fallen Leaf and Eagle Falls trail heads receive particularly high use. The northwest portions of the wilderness receive less use. Visitor permits are required year round for both overnight and day hikes. Because of its beauty and accessibility, Desolation Wilderness is one of the most heavily-used wilderness areas in the U.S. To preserve its natural beauty, use is restricted to hikers, horses, llamas and the like. There are no buildings or roads in Desolation Wilderness. Come hike, bike, and horseback ride on the spectacular Tahoe Rim Trail as it follows the ridges and mountain tops that circle Lake Tahoe. Winding for 150 miles through national forest, wilderness, and state park lands, the trail crosses thick conifer forests and wildflower-filled meadows, meanders alongside aspen-bordered creeks, and skirts the shores of crystalline lakes. Along the route, dense woods part to reveal tantalizing glimpses of sparkling water framed between the branches of ancient firs. Limitless vistas sweep around the horizon from atop high granite peaks. The TRT was built to accommodate hikers, mountain bikers, and equestrians, and to showcase breathtaking views of Lake Tahoe, California’s High Sierra, and the Great Basin of western Nevada. Lake Tahoe a 60 minute drive from Camp Nauvoo is a unique and beautiful national treasure that also boasts a rich and colorful historical past. The Washoe Indians had been gathering at its shores for centuries when American explorers Kit Carson and John Fremont came upon it in 1844. Today, Lake Tahoe still retains its pioneer charm while displaying an ancient respect for nature. For complete listings of all that South Lake Tahoe has to offer visit their website.